Caring for an aging parent is often rewarding, but anyone who has done it knows it can be stressful, too. That’s true whether you live with your parent, visit regularly or try to help from afar. Add in a career and/or kids of your own, and you probably feel pretty squeezed for time. Welcome to the sandwich generation – a generation of women and men caring for aging parents and growing kids at the same time. Many people stuck in the middle of this sandwich become good at juggling tasks and managing stress. But when too many tasks pile up, you risk developing caregiver burnout. Accept help. It can be hard to ask for help – and even harder to accept it. But that’s what friends (and family) are for. Tell your teenagers they need to take on more household chores. Hire out tasks like housecleaning or grocery shopping, if it’s financially feasible. You might also consider hiring a home health nurse or therapist through a service such as Heritage OnCare. Care for your body. You might be so busy driving your mom or dad to endless doctor’s appointments that you forget to schedule a check-up of your own. Invest in your own health by staying up-to-date with your own medical needs. Make sure to eat a balanced and nutritious diet and fit in physical activity whenever you can. Feed your mind. Your waking hours feel like a precious resource, but it’s important to make time for the things you enjoy. Whether it’s gardening, yoga, woodworking or just going to the movies, enjoyable hobbies and activities can restore your energy and boost your mood. Just say no. It’s easy to do certain things just because you’ve always done them. But take a hard look at your priorities. Does that shirt really need to be ironed? Do you need to lead that church committee? Can someone else take your spot on the neighborhood association this year? As you let go of the non-essentials, try to let go of the guilt, too. Making priorities is part of being a thoughtful and effective caregiver. Do double duty. Look for ways to cross two things off your list at once. Maybe you feel like you never have opportunities to exercise, and you also want to spend more time with your children. Ask your kids to schedule a standing date for a bike ride or evening walk together. If music brings you joy, bring your favorite CDs to play while you drive your mom to appointments. Protect your sleep. When you’re overscheduled, rest can slip down the to-do list. But regularly skimping on sleep will make you feel lousy, harm your health and sap your energy for the important things. Guard your shuteye like it’s a treasure. Take a break. If you really need a vacation (or even a staycation), consider respite care. Respite Care at Heritage Communities provides short-term assisted living respite stays. You get a break, and can rest easy knowing your parent is still receiving quality care. One final tip to keep in mind when you’re caring for an aging parent: Be honest with yourself and your family. If you’re stretched too thin to keep going, it’s not good for anyone, including your parent. 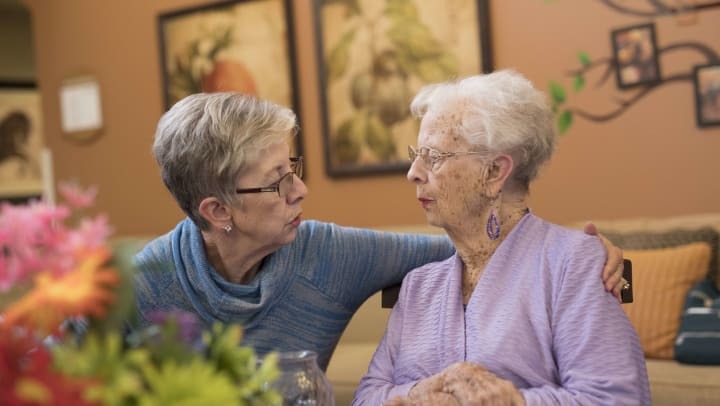 If your parents are still living at home and require more care than you can manage, it might be time to start the assisted living conversation with your mom and dad. When the time is right, find a Heritage community in your area to schedule a tour.